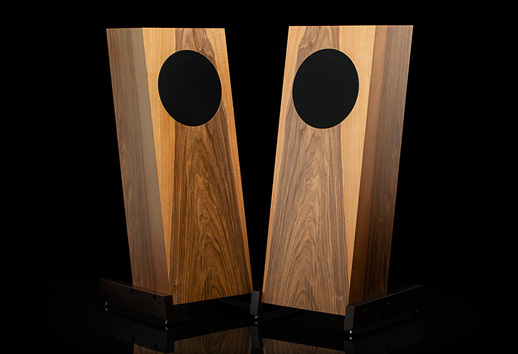 siris is a small, free-standing loudspeaker made by the Austrian company Trenner & Friedl. It's not the most expensive in its offer, and still following all the basic design objectives of its creators - Peter Trenner and Andreas Friedl. Firstly, when designing their enclosures T&F used the so-called "Golden Ratio" (Lat. Sectio aurea), in which the section is divided into two parts so that the ratio of the length of the longer ones to the shorter was the same as the entire section's to the longer part. The ratio referred to in the definition, is called the golden number and represents the Greek letter φ (pronounced "Fi"). Its value is approximately 1.618. Among other things, Greek temples were build using this ratio. These proportions give a harmonious body, that makes looking at it highly enjoyable. T & F didn't want their columns to look ostentatious, however, they wanted them to create a good aesthetic impression. The Osiris speakers while standing in my room had true class, and although small, did not disappear in the room. Their proportions are one thing, but equally important are the technical details. The cabinets are made of birch plywood of varying thickness , damped with natural wool of Australian sheep and finished with natural veneer. The wide front panel is intended to improve the directivity of transducers, and thus reduce the reflections from the walls of the room. And this in turn has lead to improved tonal balance and imaging. 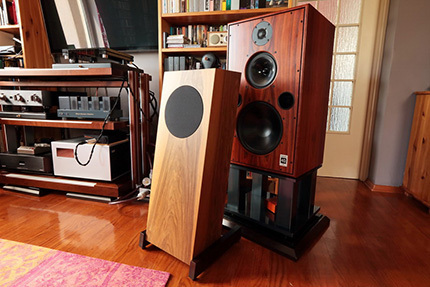 These loudspeakers look extremely elegant. Their cabinets are tilted slightly to the rear, and even though they look a lot like their bigger brother, Pharoah, they are surely sleeker. At both sides there are two stabilizing bars fixed to the cabinet, each of them equipped with two screws going down through these bars that act as speaker's feet. In the middle of the front wall one usually sees an array of drivers - but not here. As in the other columns of this manufacturer's also here drivers are hidden from our eyes. The coaxial driver with a paper cone is hidden under black grille flush with the front baffle – that's how these speakers are supposed to play. The membrane has been coated in Austria with several layers of Italian balsamic oil, which is to improve the damping. In its center a short plastic horn is mounted, which improves the directivity of titanium diaphragm tweeter. As you can see, designers wanted to achieve the best phase alignment of the drivers, hence coaxial driver (same type of driver was used for Encore! ENC-5) and tilted front baffle. φ in the case of the loudspeakers under review means not only their proportions. This ratio has been also applied in the construction of wiring used for Osiris. T & F are not the first nor probably the last company that uses this, 2.400 years old, rule. One of the best-known audio companies that adopted golden ratio for its hallmark is the American brand Cardas. Their cables are used for internal wiring of these speakers, also their speaker terminals that accept only spades are placed on the rear panel. The above mentioned cables one can not see, just as one can't really see the unique design of Osiris cabinets. These speakers combine bass-reflex design and horn, whose symmetrical port is located on the bottom of the cabinet. The combination of these two techniques is to bring the advantages of both methods, i.e. Ensure better extension at the lower end of the range, but with a better impulse response (the point is to avoid that “boomy” bass effect). 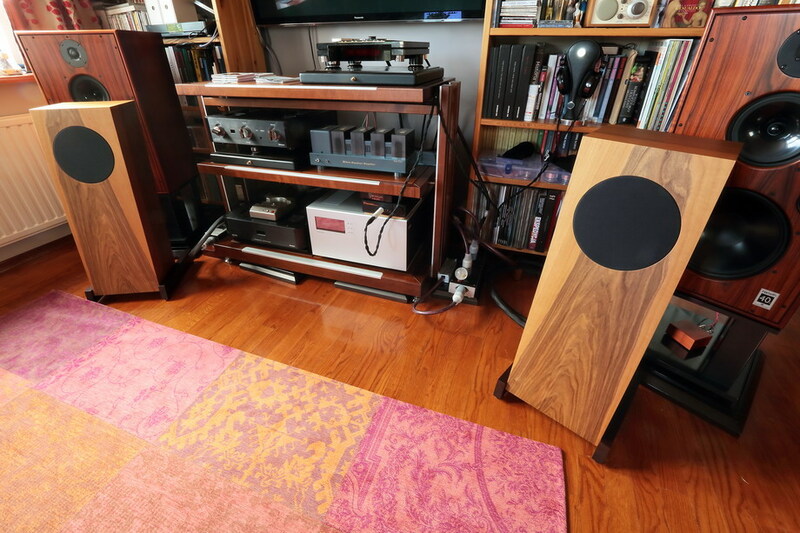 Let me repeat once again – these loudspeakers have class. Osiris is a point source with a coaxial driver; 6,5 woofer 1" compression driver, horn loaded. The paper cone of the woofer is coated with violin lacquer to make it stiffer, minimize resonances. But since Oil lacquer never gets totally stiff, it does not add extra resonances (like other lacquers do) The radiator of the HF compression driver is made of titanium. Its a vented box, with a down firing horn/reflex system. This optimizes the matching to the rooms, meaning, it is very easy to place; close to walls or corners, is the best, but it's not problematic to place it a little away from walls. But, of course this always depends on the room and system. We use sheep wool as damping material, Mundorf crossover components (hard wired) and fine Cardas cables and connectors. Cabinet is made of birch plywood. Osiris fills the gap between Art and Pharoah, and finally replaces the Dizzy, which has been out of program since a while. When designing Osiris the target was to make a kind of Panacea. These speakers should be able to fulfill the most of needs. They should perform well in small rooms but also in larger ones. It should be easy to drive (approx 89dB is a good value for a 17cm woofer system, the impedance is very easy for even tube amps). It should become a music machine, which had priority over all other characteristics. It seems that the term "musical machine" which Andreas used in A few simple words... perfectly describes these loudspeakers. Indeed it is so that when listening to Osiris one forgets about the mechanics behind music reproduction. I'm not talking about the "naturalness" of the sound, because whenever music registration is involved naturalness is arbitrary (whatever you've been told), but of such a form of music presentation, that makes it easy to "forget" that one sits in front of a pair of loudspeakers; listening to the music comes so easy with these speakers.